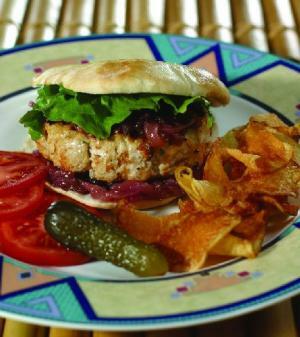 Lean, delicious turkey burgers, served with a tart-sweet red onion confit on pita bread. The confit can be prepared ahead of time. It keeps for up to six weeks covered and refrigerated. It is also great with steak or on turkey sandwiches. Serve the burgers with assorted mustards and good half-sour pickles, a bowl of lettuce, and a plate of sliced tomatoes. To make the confit, in a large nonreactive saucepan, heat the oil over medium-low heat. Add the onions, sugar, salt, pepper, and bay leaves. Cover and cook until the onions are soft and translucent, about 30 minutes. Uncover and add the vinegars. Turn the heat to high and cook, stirring constantly, until most of the liquid is gone, about 15 minutes. Allow to cool. Prepare a grill or preheat the broiler. Cook the burgers about 4 inches from the heat until cooked through, 4 to 6 minutes per side. Warm the pita bread on the grill or in the oven. Fill each of the pitas with a burger and some of the confit. Serve.